Apart from the fact that the Congress may find it difficult to say no given how Manvendra took on the gauntlet of fighting against Raje, the Rajput leader also stands favourably in the changing equations between the community and Jats in western Rajasthan. Back in the 2014 Lok Sabha elections, the Congress had finished third in the battle for Barmer, behind former Union minister Jaswant Singh fighting as an Independent and winner Sonaram Choudhary, who was a Congress-turned-BJP leader. Five years later, the tables are turned. Among the leading contenders for the Barmer seat from the Congress side now is Jaswant Singh’s son Manvendra Singh, who left the BJP in September last year and joined the Congress a month later. Fielded by the Congress to take on sitting chief minister Vasundhara Raje from Jhalrapatan constituency in the December Assembly elections, Manvendra had lost. But Manvendra, who has been both an MLA and MP on a BJP ticket earlier, has been clear his interest lies more in fighting the parliamentary elections. 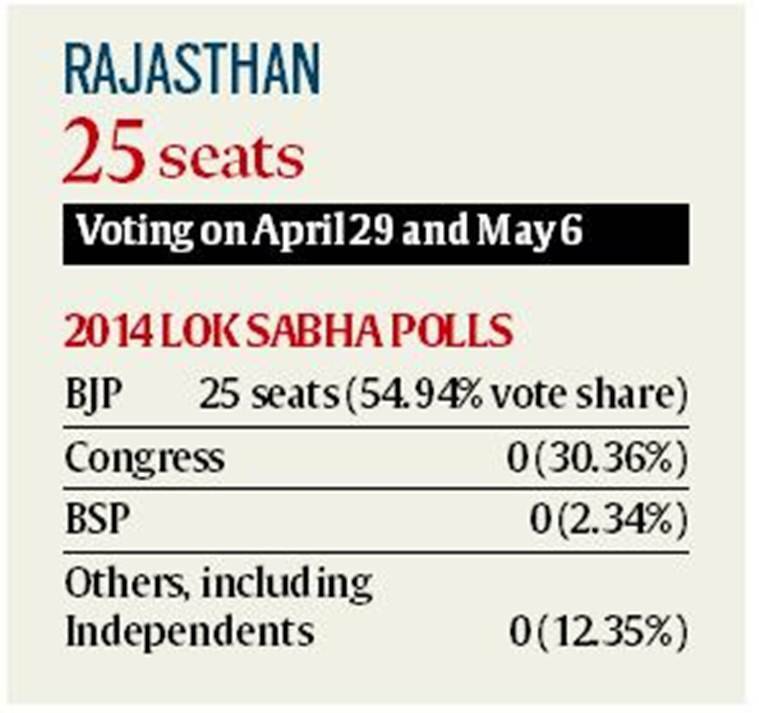 The Barmer Lok Sabha constituency has a high proportion of both Rajputs and Jats. In the Assembly elections, of its eight Assembly segments — Jaisalmer, Sheo, Barmer, Baytoo, Pachpadra, Siwana, Gudamalani and Chohtan — the Congress had won seven. Among the BJP’s losing candidates was Sonaram, a Jat, who had been fielded from the Barmer segment. Since 1991, Jat candidates have been victorious from Barmer every time, with only 2004 being an exception, when Manvendra had won on a BJP ticket. The Congress itself has always fielded a Jat candidate since 1991. In Rajasthan, the Rajputs have traditionally been voters of the BJP and Jats of the Congress. But the Rajputs have been angry with the BJP for sidelining Jaswant Singh, who had been denied a ticket in 2014. Congress sources admit that Manvendra joining the party along with members of his ‘Swabhiman Sena’ has gone a long way towards making it attractive for the Rajputs. Party sources hope Manvendra would now get the Congress Rajput votes even as Muslim votes stay with it, though it may lose some Jat votes. But, among those fancying his chances from the seat on a Congress ticket is Harish Choudhary, a Jat Cabinet minister in the Ashok Gehlot-led Congress government and an MLA from Baytoo. “If my party decides to field me for the Lok Sabha elections, I will definitely contest. My personal interest has always been to contest parliamentary polls rather than the Assembly elections. At the end it’s the party’s prerogative,” Choudhary said. In fact, recently Harish Choudhary also urged Sonaram to return, saying his real place was in the Congress — which was seen as another bid by the Jats to keep out Manvendra. “Col Sonaram Choudhary is a farmer leader of high stature. I have always maintained that he is currently in the wrong place,” Harish Choudhary told reporters. Manvendra admitted he was vying for the Barmer seat. “In a democracy, it’s everybody’s right to ask for a nomination. Yes, I am looking to contest this year’s elections. My family, roots are here, and my interest in contesting the elections from this place stems from that,” he told The Indian Express.